The Palestinian Authority (PA) apparatuses on Monday arrested five Palestinians affiliated with Hamas and summoned three more others for interrogation in a mass abduction campaign launched across the West Bank. Hamas said in a statement the PA General Intelligence Service re-captured the citizen Rani al-Barghouti, from Kafr Ein village, just a few days after he had been released from the PA lock-ups. The PA intelligence devices further detained the citizen Fakhr al-Rentisi, working for the Aman network against corruption, after having summoned him for interrogation. Meanwhile, Mohamed Sakr, a student at the Birzeit University, has gone on a hunger-strike in protest at being held in custody by the Ramallah-based Preventive Forces. The PA preventive apparatuses have also kept the youngster Momen Awad in remand since five days. In Nablus, the PA Preventive Forces nabbed the 48-year-old ex-detainee and preacher Fahmi al-Az’ar, after he was summoned for interrogation. The PA devices also extended the remand of the university student Mujahed Ashur for 15 days pending further interrogation. The PA security branches in Qalqilya province rounded up the 24-year-old student Samer Raslat, enrolled at the Islamic University, following a gifts distribution ceremony commemorating the Prophet of Islam, Muhammad, Peace Be Upon Him. The Bethlehem-based PA apparatuses summoned the ex-detainee Moazez Abiyat for interrogation, only 10 days after he was released from the Israeli occupation jails. The same devices nabbed the ex-detainee Omar Habib. Political detainee Islam Al-Wardiyan has been on a hunger-strike for 10 days running in protest at being held arbitrarily by the PA. The Tulkarem-headquarted Preventive Forces also captured the university student Yosri Aweis while the PA devices in Jenin summoned the student Harun Abu al-Heija for interrogation. A fruit and vegetable vendor set fire to his stand in the West Bank city of Tulkarem, on Sunday, in protest over a decision by local authorities to remove the stand, which was his main source of income. Local sources told Ma'an News Agency that Palestinian police arrested 30-year-old Muhammad Awwad, after he set fire to the stand. 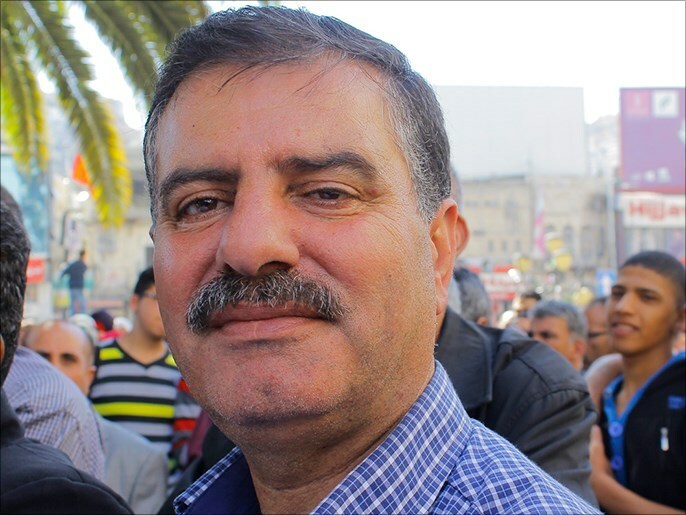 Awwad set up the stand near a mosque in the center of Tulkarem, in the northern occupied West Bank, in the hope of earning a living after he was released from the Israeli prison system several months ago. A number of municipal councils across the West Bank have cracked down on street vendors in recent years, claiming that they disrupt movement of vehicles and people and are unattractive in appearance. 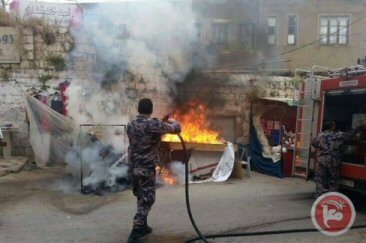 In 2013, a street vendor attempted to set himself on fire in Nablus after police confiscated his fruit stall. Muhammad Yaesh, 40, poured gasoline on himself near a roundabout in the city before police prevented him from setting it alight. Yaesh, who provided for a family of 12, told Ma'an after the incident: "I decided to set myself on fire, and to pour gasoline on myself, because I reached a desperate level. I reached a level where life and death are equal to me and have the same meaning." The attempted act recalled Tunisian street vendor Muhammad Bouazizi, who in 2010 set himself alight following the confiscation of his stand, an act that sparked the Tunisian Revolution and revolutions across the wider Arab world. In 2013, al-Monitor reported that Palestinian protesters in Ramallah held posters bearing slogans such as: "No salaries, no carts. God help us," and "Where is justice for the people, Abbas and Fayyad?" The article asserted: "The fact that it was the self-immolation of a poor Tunisian cart-seller that catapulted the Arab revolutions at the end of 2010 seems to be lost on the PA government officials, who are concerned with synthetic appearances over the interests of the people they claim to represent." 13 Palestinian human rights organizations strongly denounced Thursday the Palestinian Authority security forces for carrying out massive arrests and summons among Birzeit University students over their political activities. 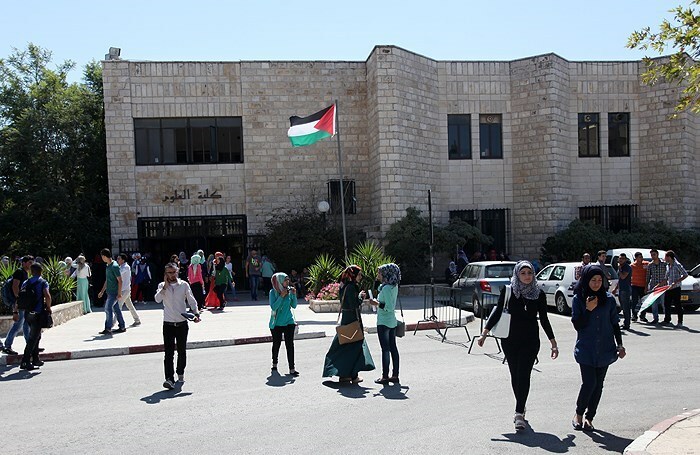 In a press release on Thursday, the organizations affirmed that 20 Palestinian students at Birzeit University were either arrested or summoned for their political affiliation. The recent political arrests came shortly after Islamic Wafaa' Bloc's victory with a majority of 26 out of 51 seats in the Birzeit University Student Council elections held on April 22, 2015, the statement pointed out. The press release added that the arrested students were subjected to tough investigation about the Islamic bloc's student activities and the reasons behind its winning. "At least two students were subjected to severe beating and torture for long hours during their investigation process," the statement affirmed. 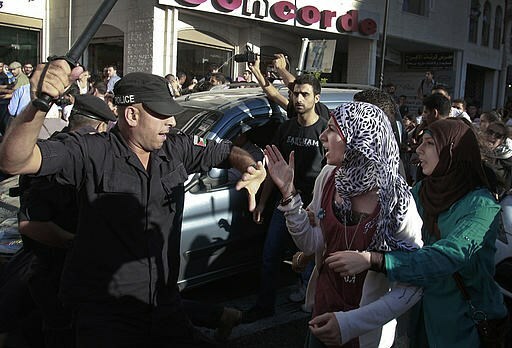 Since April 26, dozens of Birzeit University students were reportedly summoned for investigation to be then released. Some of them were summoned more than once, while three students remained held in PA detention centers. The PA political arrests and violations came in total contradiction to freedom of expression and students’ rights of political participation constitutionally guaranteed for Palestinian citizens in accordance with international human rights standards. The statement demanded the PA and its security forces to immediately end and prohibit the political arrest campaigns in the West Bank and side with the students’ rights to participate in political life. The statement also called for opening an investigation into the PA security forces’ reported violations during the recent arrests especially that they were carried out illegally and without reason. Human Rights Watch on Thursday accused the Palestinian Authority (PA) security forces of arresting West Bank students over their pro-Hamas political affiliations and opinions , saying several had been mistreated. “It is deeply worrying that students are being held by PA forces for no apparent reason other than their ties with Hamas or their opinions,” said Sarah Leah Whitson, Middle East and North Africa director. 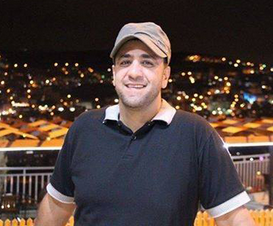 On April 25, 2015, PA security officers arrested Jihad Salim, representative of a Hamas-affiliated student group at Birzeit University in Ramallah, following the group’s victory in Birzeit’s student council election, Human Rights Watch reported. The officers assaulted Salim’s mother and sister shortly before they brutally beat him and held him for about 24 hours, Salim told the organization. The PA devices further arrested former student at Birzeit University, Ayman Abu Aram, questioned him about his affiliation with Hamas, and held him for 24 hours, his attorney told Human Rights Watch. The latest case follows the November 2014 arrest, alleged beating, and criminal charges against Ayman Mahariq, a journalism student, for critical postings about Palestinian Authority forces on Facebook. Mahariq was released after 30 days of detention, during which he had reportedly been subjected to severe torture. Islamic Resistance Movement, Hamas, said the statements made by the spokesman of Palestinian Authority Security Forces Adnan al-Damiri aim at hiding the truth in regards with targeting Hamas and Islamic Jihad members by PA forces. Hamas spokesman Sami Abu Zuhri said, in a statement on Wednesday, “it is no longer possible to deny the security coordination between PA and Israel in light of the fact that Palestinian President Mahmud Abbas described it as “holy". Abu Zuhri added that it cannot be denied in light of PA’s daily large-scale arrest campaigns against members of Hamas and Islamic Jihad in the West Bank including university students, pressmen, ex-detainees and others. Earlier on Wednesday in a press conference, Damiri said that “PA forces did not, do not and will not carry out political arrests”. The press conference was held after Hamas and Islamic Jihad had asked Palestinian President Mahmud Abbas and Palestinian Prime Minister Rami al-Hamdallah to halt the political arrests and called for freedom of speech. The Palestinian authority (PA) apparatuses rounded up four Palestinian citizens and attempted to apprehend four others on accounts of their political affiliations. Sources based in al-Khalil said the PA General Intelligence Service attempted to kidnap four students affiliated with the Islamic Bloc at the Polytechnic University after chasing them down inside the campus. The PA forces came down heavily on the family of the representative of the Islamic Bloc at the Polytechnic university, Abdul Rahman al-Khatib, and ordered them to give their son in to the PA devices at the soonest time possible. Meanwhile, the PA devices have been keeping the university student Hazem al-Sherif in custody for the six day running. In Tulkarem, the PA preventive forces apprehended the Hamas leader and ex-prisoner Iyad Naser after having summoned him for interrogation. The Jenin-based Preventive forces re-captured the university student As’ad Hamran, enrolled at al-Quds Open University, a few hours after he was released from the PA penitentiaries. The campaign culminated in the abduction of the photojournalist Mohamed Awad, working for the Watan Tv Channel. In Nablus, the PA apparatuses captured the ex-prisoner Hosni al-Amoudi and have kept Hazem Asei’ra in custody for the 10th day running. Along the same line, the Monetary Authority detained the journalist Zied Abu Ara, working for the Quds Press news agency. Hamas and Islamic Jihad movements warned during a protest vigil organized in Gaza Strip on Tuesday morning of the PA political arrest campaigns in occupied West Bank, calling for reinforcing Palestinian national unity. 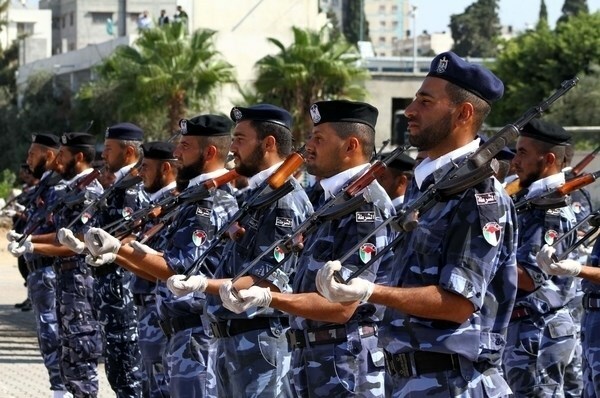 Spokesman for Hamas movement Sami Abu Zuhri stated that PA security forces’ continued political arrests against members and supporters of Hamas and Jihad movement mainly target resistance project. "Security coordination between PA and Israeli forces aims at liquidating resistance project in West Bank and Gaza Strip," he said. "Political arrests against university students and ex-prisoners in West Bank cannot be justified," Abu Zuhri added, pointing to the recent arrest campaign targeting Birzeit university’s students and Jihad movement’s members in West Bank. He called for the immediate release of all political detainees from PA jails and detention centers. 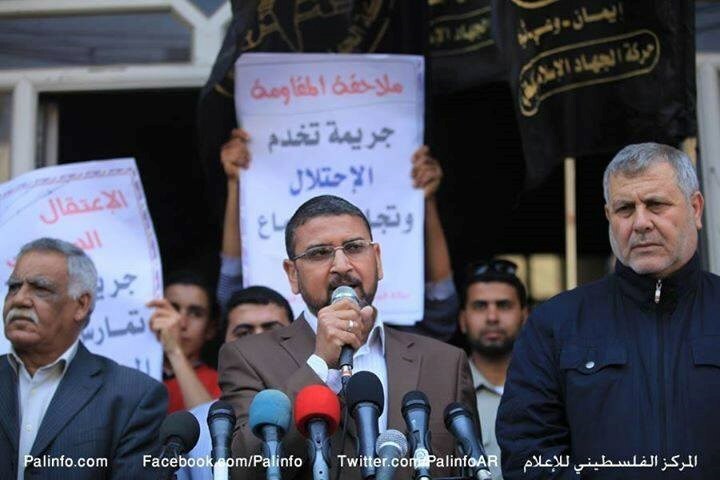 Abu Zuhri praised the political detainee Islam Hamid’s strong determination as he continues his hunger strike for 40 days in protest against his continued detention in PA jails. Hamas’s spokesperson called on PA chairman Mahmoud Abbas and Prime Minister Rami Hamdallah to bear their national responsibilities and to release prisoners of conscience. Political differences could be solved through dialogue and communication, not through arrests and repression, he said. For his part, the senior leader in Jihad movement Khaled Batsh denounced the PA escalated prosecution of ex-detainees and members of his group in West Bank. He stressed the urgent need to unite all efforts to release Palestinian prisoners from Israeli jails, and not to arrest their family members. The PA Security Services continue to detain 60 Palestinian citizens over their political affiliation. Most of the political detainees are members and supporters of Hamas movement, the Committee of Political Detainees’ Families said in a report issued on Sunday. The report pointed out that the 60 political detainees held in PA jails include 15 citizens from al-Khalil, ten others from Nablus, ten political prisoners from Qalqilia, ten other citizens from Ramallah, five others from Tulkrem, five other citizens from Jenin, in addition to two detainees from Tubas and Salfit, and one detainee from occupied Jerusalem. The political detainees also include 10 university students, the report said. 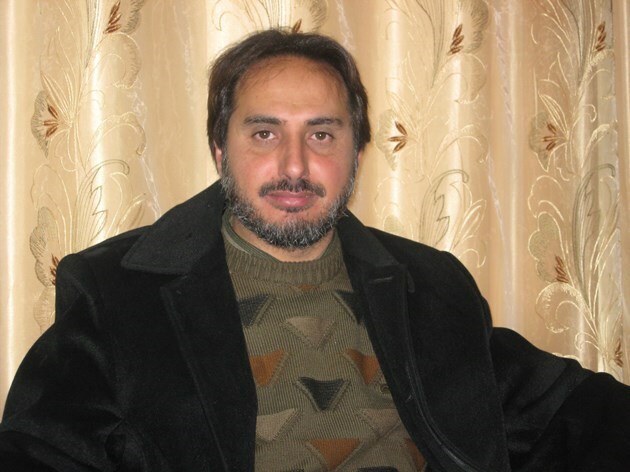 An activist in the Popular Front for the Liberation of Palestine-PFLP has been held in PA jails since April 2009, while three members of the Islamic Jihad movement have been detained since March 2010. Seven members of Hamas movement have been jailed in PA prisons for more than five years, according to the report. The list of political detainees includes neither those detained by PA forces over the past 24 hours in West Bank nor those who have been released few days after their arrest. The Islamic Jihad movement on Saturday accused the Palestinian Authority of arresting and harassing its members in the occupied West Bank. Islamic Jihad said in a statement that PA security forces had arrested members in Jenin, Tulkarem, Ramallah, and Hebron governorates. 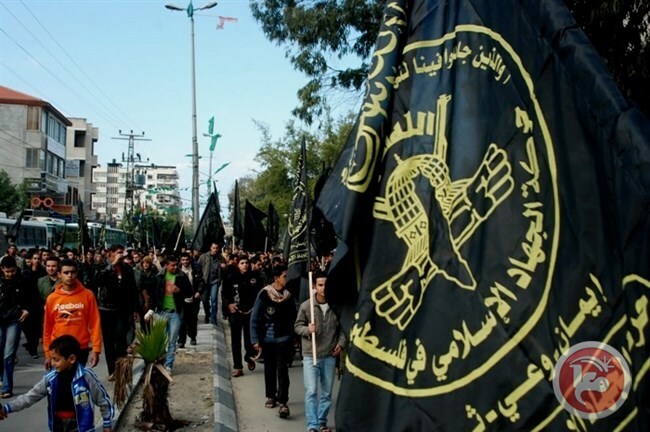 The statement alleged that the PA had summoned students and activists affiliated to Islamic Jihad and threatened to imprison them if they partake in political or student activities. The statement also accused PA security forces of targeting Palestinians formerly held in Israeli prisons. "Summoning prisoners after they have been freed from Israeli jails poses a question mark over how serious the PA is about defending Palestinian prisoners in Israeli custody," the statement said. The accusations come after a spate of PA arrests across the occupied West Bank, which police insist has been aimed at criminal activity and not political opponents. 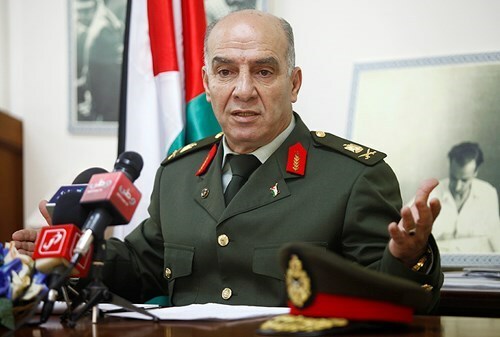 Spokesperson for Palestinian security services in the West Bank Major-General Adnan Dmeiri told Ma'an that Palestinian security services "never arrest any Palestinian because of affiliation to a political party or due to their political point of view." He said that all arrests were due to "criminal activity," and that the judiciary system had "the final say in any charges, as according to the Palestinian penal code." Dmeiri also suggested that there had been fewer arrests than was widely suggested. He accused Hamas and other political factions of "circulating black propaganda to protect their members who are involved in illegal activities." Many of the recent arrests have taken place in Area C, where Palestinian security forces have limited power. Under the Oslo Accord, Israel has full civil and military authority in Area C, and Israeli forces rarely arrest Palestinian criminals who they do not deem a "security threat" to Israel. 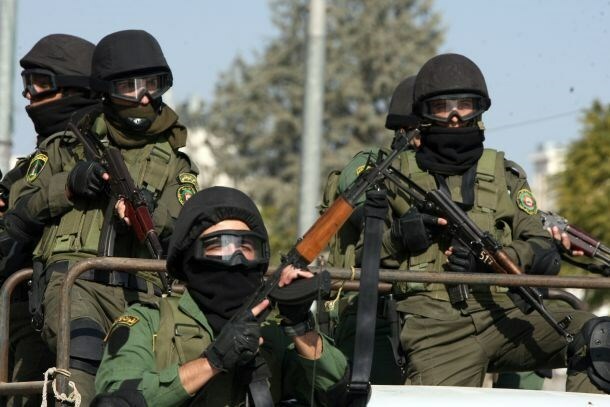 International Crisis Group reported in 2010 that while Israel has in the past allowed Palestinian police forces to carry out limited operations in Area C, these were mostly for purposes of fighting political opponents, including members of Hamas, and rarely to combat ordinary crime. As a result, Area C has for years harbored Palestinian criminals, including collaborators with Israel, the ICC report said. The recent spate of arrests suggests that Israel has been allowing increased Palestinian police activity in Area C, although Islamic Jihad's claims cast doubt on the nature of the arrests. While Islamic Jihad alleges that the arrests are politically motivated, the PA says that they are targeting criminals, and suspected drug dealers are among those they have brought in. In March, preceding the current spate of arrests, Israeli forces prevented Palestinian security forces from detaining suspected drug dealers in eastern Nablus, despite prior security coordination. Asked why Israel was allowing greater Palestinian security activity in Area C, Dmeiri said: "I can't explain the Israeli temper," although he added: "It is never related to any political compromises between Israel and the PA." He suggested that the increased flexibility could be due to the fact that criminal activity that thrives in Area C was beginning to cross into Israel and was having a negative impact on Israel. Several MPs of the Palestinian Legislative Council (PLC) on Thursday held the Palestinian Authority (PA) Chairman Mahmoud Abbas accountable for an assault by the PA Preventive Forces, earlier in the day, on the house of the newly-released MP Abdul Jabar Fokaha. The MPs slammed, in a joint-statement, such an abrupt break-in, saying it aims at marring the joyful mood and dampening the high spirits experienced by the family the day of their son’s release from the Israeli occupation jails. The MPs branded the assault a barefaced proof of the PA’s biased positions vis-à-vis a certain category of people and political affiliations. “This just testifies to the PA’s dragging of its feet regarding national reconciliation,” the statement read. The statement called for taking a firm line on these ongoing violations by the PA forces, urging the PA to boost national consensus and restore peace and avoid all forms of dishonesty and bias. The MPs further appealed to the Freedom’s Committee and the Independent Commission for Human Rights, among other national and international organizations, to speak up against such unwarrantable infringements of Palestinians’ rights. Earlier, at noontime on Thursday, the PA preventive forces stormed Fokaha’s family home, just a few hours after he was unshackled from the Israeli occupation bars. A live video footage of the assault shows the PA forces removing and taking away Hamas banners in such a remarkably panic-stricken manner. The family expressed their firm disapproval of the assault, saying it breaches the parliamentary immunity supposedly granted to the PLC deputies. Fokaha, father of five children, had been incarcerated for over 100 months in the Israeli occupation lock-ups, mostly in administrative detention. A Palestinian political detainee from Occupied Jerusalem has reportedly been subjected to psycho-physical torture at the Palestinian Authority (PA) lock-ups in the West Bank city Bethlehem. A PIC correspondent quoted the family of the 38-year-old political prisoner Ayman Mohamed Abu Eid as reporting that their son has been severely tortured by the Bethlehem-based PA intelligence over the past six days. Prisoner Abu Eid is neither able to walk nor stand on his feet on his own due to the heavy beatings he has been made to endure all the way through, the same sources added. The political detainee has also been hit with a wooden baton on his back, limbs, stomach, and the soles of his feet all along the six days he had spent in Bethlehem jail. Abu Eid showed traces of severe torture, including swelling, blood congestion, weight loss, and balance disorders. The intelligence services have kept Abu Eid in custody despite an earlier court decree, issued by the High Court of Justice, ruling his release on March 1. The detainee was re-captured by the Bethlehem apparatuses shortly after the Jericho intelligence devices issued a decision to unshackle him. The family lost contact with their re-captured son and was not updated on his incarceration until Monday. Abu Eid’s family urged all humanitarian and human rights organizations, both nationwide and overseas, to immediately step in, follow up on their son’s case, and save his life before it is too late. Abu Eid, is an ex-prisoner who had served a total of 14 years at the Israeli occupation jails and one year and a half in the PA prisons. Abu Eid was shot and nabbed by the intelligence apparatuses on 28 January in a local market.